Geography/Culture:Hindustani. (A popular name of Devi in the Sakta cult). [Note from FW to self: there really doesn't seem enough to distinguish Her, from others. Bhuvanesvari could replace Her because there is the Woodroffe hymn, and such a replacement would not disturb HCT ordering. However that would make Rajarajesvari redundant. Try and solve either by placing Bhavani under Rajarajesvari, or vice versa - which ever one is easier to replace]. Description: Great elemental Mother Goddess of earth, life, nature, death and perpetual renewal; Untraversable Ocean of mercy; Root of the world; She Who gives life to Bhava. See also the Goddess Anthology. In the hymn to Bhairavi there is a reference to Bhavani. [There are more references to Her in the hymn to Bhuvanesvari, Woodroffe, p31]. To Whom are sacred: lotus; thorn-apple (and its poison); tortoise; jackals; cattle; skull; the Thugs were Her devotees; the art of garrotting. Consort: Bhava, `Giver-of-Existence', a form of Siva as Lord or cattle and men. Also said to be one of the eight forms of Rudra. Stutley HDH 44. Perhaps the Bhavini(s), below, draw their name from Her. A title of: Bhairavi, qv. Also called: Bhuvanesvari, qv Rajarajesvari. 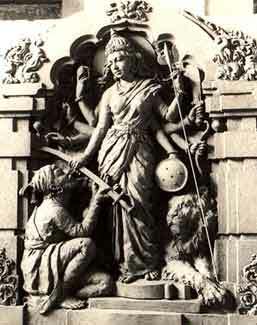 A form of Kali, qv. Description: Women dedicated to the service of the temple. In a town near Madras members of the weaver caste dedicated their eldest daughters to the temple. A marriage ceremony was performed in which the girls were wedded to a dagger, or to a mask of the God. Description: [Try and develope Trimurti]. [Note: My earlier notes read: "Trimurti actually refers to the male triad Brahma (equilibrium between), Visnu (centripetal, preservation and renewal), and Siva (centrifugal, disintergration and destruction). As a forename of Bhavani it suggests She is the origin of this triad. worked on: August 1995; August 1991; July 1990.